A fraction is nothing more than a piece of something. Understanding fractions will be a lot easier when we think in terms of money. But first, let's take a look at the parts of a fraction, the "top" and "bottom." The "top" (numerator) is the number of pieces that you have. The "bottom" (denominator) is the total number of pieces that the original object was cut in to. Here we have dollar bill, or $1. Let's take this dollar bill and "cut it" into four equal pieces. The bottom of our fraction, which we now know is called the denominator, is 4. 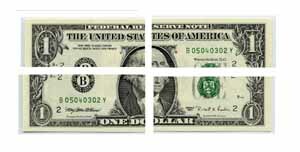 Notice how our original dollar bill is now in fourths, or four pieces. What do we call fourths of a dollar? The top of our fraction is the number of pieces that we have. In this case, we still have all four quarters, so our fraction will be 4/4. How much money do you have if you have 4 quarters? That's right, you have $1. Therefore, you shouldn't be surprised that 4/4 reduces to 1. You may want to learn more about equivalent fractions. Imagine now that you have spent $.75 of your $1. You only have 1 quarter left. What fraction of a dollar do you have? One-fourth of a dollar is $.25. Likewise, the fraction 1/4 is equivalent to the decimal .25. For other fraction to decimal conversions, look at our conversion chart. 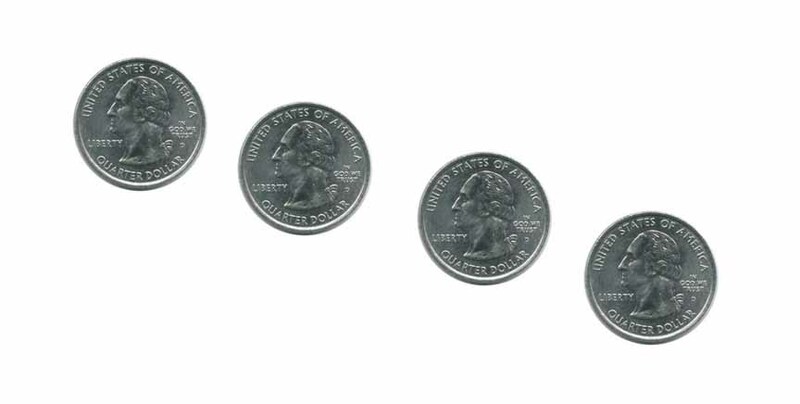 If you always think of fractions as parts of a dollar - or parts of bigger dollar bills - they should make more sense. Remember, a fraction is just a piece of something like coins are a piece of dollar bills. Return from understanding fractions to other rules of fractions. You may also explore other math topics at the Grade A homepage.